Despite many efforts to sustain parasitoid populations in agroecosystems to help control pests, relatively little is known about parasitoid-flower interactions and how dependent each partner is on the other. There are few comprehensive, species-specific, community-level observations of parasitoid-flower interactions. Observing flower visitation by parasitoid species is challenging because most parasitoids are small and visit flowers infrequently. Further, the extreme diversity of parasitoids poses challenges for identification, and only a few experts can identify parasitoids to species. To explore the potential for a flower-visitor network approach to improve our understanding of parasitoid foraging ecology, we utilized published and publicly available flower-visitor datasets from the Interaction Web Database. Parasitoid species were present in almost half of the flower-visitor datasets in the Interaction Web Database but constituted a very small proportion of all flower visiting species. We analyzed the only parasitoid-flower subnetwork that was both speciose and documented heterogeneity in the number of flowering plant species visited by parasitoids. On average, parasitoids were more generalized in flower visitation than predicted under null expectations, given their prevalence in the network. Further, many individual flower and parasitoid species might be more generalized than they appeared as evidenced by a specialization metric less biased by sampling effects. These plant and parasitoid species might therefore be more useful for conservation biological control efforts than initially expected. Finally, the nested structure of the network indicates the potential for a subset of the flower community to support generalized, and any potential specialized, parasitoid nectar foragers in the field. The online version of this article ( https://doi.org/10.1007/s11829-018-9642-9) contains supplementary material, which is available to authorized users. The Hymenoptera are the most species-rich animal order, largely because of the hyperdiverse parasitoid wasps (hereafter “parasitoids”; Forbes et al. 2018). Their life history consists of oviposition in or on an arthropod host where the developing larva(e) feed and pupate, eventually killing the host (Godfray 1994). Parasitoids can exert strong control of host populations (Godfray 1994). In agroecosystems, pest control services from natural enemies, including parasitoids, are a component of integrated pest management strategies that minimize the use of pesticides and their environmental impacts (Begg et al. 2017). Although the economic value of biological control services by natural enemies is difficult to assess (Naranjo et al. 2015), past studies have estimated an annual worth of pest control services to be 4.5 billion USD in the United States (Losey and Vaughan 2008) and 238–400 billion USD annually worldwide (Pimentel et al. 1997; Costanza et al. 1997). To sustain parasitoid populations, land managers must overcome the severe non-host resource limitations faced by parasitoids in agroecosystems (Wäckers and van Rijn 2012). Floral nectar is an important non-host resource, and its fitness benefits to parasitoids are well documented (see meta-analysis by Russell 2015). While floral resource addition has enhanced biological control by parasitoids in many agroecosystems, such as alfalfa (Araj et al. 2009), cabbage (Géneau et al. 2012), grapes (Begum et al. 2006), rice (Gurr et al. 2016), tomato (Balzan et al. 2014), and wheat (Tylianakis et al. 2004), this endeavor has been met with mixed success (Heimpel and Jervis 2005). Failures may be driven by other limiting resources (Gillespie et al. 2016) or inappropriate choices in floral resource type. It has been noted that flowering plant species used to support parasitoids in agricultural systems, a common approach in conservation biological control, are often selected “more or less arbitrarily” (Gurr et al. 2005; Wäckers and van Rijn 2012). In addition, the level of generality of these parasitoids in their nectar foraging behavior is unknown. One potential reason for this is that only a small subset of flowering plant taxa have been studied in relation to their suitability to match foraging preferences and enhance performance of nectar foraging parasitoids (Tompkins et al. 2010; Russell 2015). Therefore, there is limited knowledge of parasitoid-flower associations in the field, and many aspects of parasitoid nectar foraging ecology remain unanswered (Tompkins et al. 2010; Wäckers and van Rijn 2012). At a community-wide scale, field surveys indicate that parasitoid diversity is positively correlated with plant diversity, which may in part be due to floral resources provided by different plant species supporting different parasitoid species (e.g. Letourneau et al. 2015). However, the scale of such surveys does not elucidate species-specific associations or reveal the particular role nectar resources might play in driving this pattern. Only a handful of studies have documented species-specific flower visitation by parasitoids in plant communities. These include flower visitation studies in managed settings such as botanical gardens (Al-Doghairi and Cranshaw 1999), field margins and hedgerows (Bugg and Wilson 1989), and market and herb gardens (Maingay et al. 1991), as well as in natural settings in the Canadian high arctic (Kevan 1973), the United Kingdom (Jervis et al. 1993), Austria (Hassan 1967), and southwestern Australia (Menz et al. 2015). 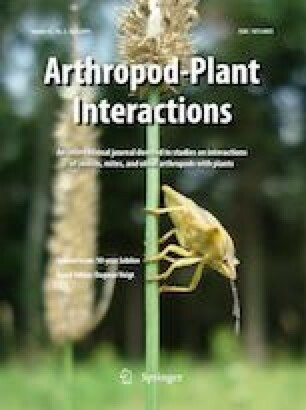 These studies suggest variable interaction structure between parasitoids and their nectar resources; some indicate generalization and resource overlap of nectar host plants by parasitoids, and others observed apparent specialization of parasitoid-flower interactions. While these surveys have been an invaluable source of information on parasitoid natural history, they also have various limitations including low or unknown sampling effort, low number of plant species observed, or admittedly biased sampling effort for larger parasitoids or flowers with exposed nectaries. As a result, many basic questions about parasitoid nectar foraging remain unresolved. For example, do parasitoids tend to be generalist or specialist nectar foragers? Do any parasitoid species visit an unusually large number of floral resource host species for nectar (“super-generalists”)? How are parasitoid-flower interactions structured? Are few or many flowering plant species required to support the majority of the parasitoids in a community? To answer these basic ecological questions, intensive observation of species-specific flower visitor interactions is required at a community scale. Observing flower visitation by parasitoid species is challenging because most parasitoids are small and visit flowers infrequently relative to other flower visitors. Further, the extreme diversity of parasitoids poses challenges for identification, and only a few experts can identify parasitoids to species. Intensive, unbiased parasitoid-flower surveys are required to understand nectaring ecology (Jervis et al. 1993), but existing sources of species-specific, community-level parasitoid-flower association data may be available in published flower visitor networks. In the last decade, the observation and analysis of plant-flower visitor networks have documented consistency of interaction partners within and across years (Burkle et al. 2013; CaraDonna et al. 2017), the structure of their interactions (Bascompte and Jordano 2013), and the structural implications on the stability (Thébault and Fontaine 2010) and conservation (Tylianakis et al. 2010) of these interactions. While these observational studies tend to focus on larger insects that contact reproductive parts and/or display floral constancy (i.e., species perceived to be efficient pollinators), hymenopteran parasitoids may be represented in these datasets even though they are not typically considered efficient pollinators. Relative to existing parasitoid-flower community surveys, flower-visitor networks are much more numerous and have more intensive and consistent sampling efforts on higher numbers of flowering plant species. As such, while not focused on parasitoid-flower visitors per se, these databases may provide insight into parasitoid-flower visitation ecology. We applied a flower visitor network approach to the published and publicly available flower-visitor datasets from the Interaction Web Database (http://www.nceas.ucsb.edu/interactionweb) to explore patterns in parasitoid nectar-foraging ecology. Specifically, our goals were to (1) evaluate the overall quality and/or biases of published pollination network studies as a source of information on parasitoid-flower associations, (2) determine the level of generality in nectar foraging interactions in a focal dataset of flowers and parasitoids, as well as the overall network structure of parasitoid-flower interactions, and (3) briefly outline implications for conservation biological control and future research. We downloaded all flower visitation datasets from the Interaction Web Database (IWD) that were uploaded as of March 2017 (N = 31) (Arroyo et al. 1982; Barrett and Helenurm 1987; Bartomeus et al. 2008; Bezerra et al. 2009; Clements and Long 1923; Hocking 1968; Inouye and Pyke 1988; Kaiser-Bunbury et al. 2009; Kevan 1970; McMullen 1993; Medan et al. 2002; Mosquin and Martin 1967; Motten 1982; Olesen et al. 2002, 2003; Ramirez and Brito 1992; Santos et al. 2010; Schemske et al. 1978; Small 1976; Varassin and Sazima 2012 and Vázquez and Simberloff 2002). For each dataset, we identified all species that are considered parasitoids in the strict sense (insects that kill and consume one host during development; Godfray 1994). Species that were identified as unknown at the ordinal level (e.g., “unknown Hymenopteran”) were not included in analyses; this resulted in two datasets (i.e., Memmot 1999; Vizentin-Bugoni et al. 2016) being discarded. With the compiled data, we quantified the number and proportion of parasitoids out of all flower visitor species in each dataset. All analyses were conducted in R version 3.2.1 (R Core Team 2016). Of the IWD networks that documented parasitoid-flower interactions, only one had enough information to analyze with network metrics in a meaningful way. Eleven of the 29 datasets included at least one parasitoid wasp species (Fig. 1). Of these 11 datasets, 6 included only 6 or fewer parasitoid species. The remaining five datasets included 13 or more parasitoid species, though in four datasets nearly all of the parasitoid species were observed with only one interaction partner (68/69 species, Kato et al. 1990; 16/21; Elberling and Olesen 1999; 12/15, Vazquez and; Simberloff 2002; 9/13; Kevan et al. 1973), which is insufficient variation for analyses of specificity and interaction structure. Further, conclusions of high specificity may be unwarranted if observation numbers for each species are low (Jervis et al. 1993). The sole dataset that was both speciose and documented heterogeneity in the number of flowering plant species visited by parasitoids was Robertson (1929). In his effort to “ascertain the different kinds of insect visitors” of different flowering plant species, Robertson documented over 15,172 insect visits to 456 flowering plant species. His observations were conducted from 1887 to 1916 and took place within a 10-mile radius of Carlinville, Illinois (Robertson 1929). Robertson observed 107 parasitoid species foraging on the flowers of 56 flowering plant species. Tooker and Hanks (2000) reported that Robertson documented 151 wasp species foraging on 112 plant species, but our numbers are smaller because we include only parasitoids in the strict sense, whereas Tooker and Hanks (2000) included a broader set of species including families that are “primarily parasitic.” Since pollen foraging by parasitoids is extremely rare (Kevan 1973; Jervis et al. 1993; Heimpel and Jervis 2005; Gillespie et al. 2016; Gurr et al. 2017), we assume that the parasitoid-flower associations documented by Robertson were primarily cases of nectar foraging, although some could have been searching for hosts within flowers. While Robertson did not record sampling intensity or quantitative interaction frequency, his dataset provides unusually rich documentation of parasitoid-flower associations. Indeed, prior work has already utilized the dataset to explore parasitoid preference across flowering plant species (Tooker and Hanks 2000). Here, we build upon these initial analyses with a more comprehensive analysis of parasitoid-flower interactions and assess their deviation from null expectations. The following analyses and results reflect the parasitoid-flower interactions reported by Robertson. It is often unclear how to interpret analyses of natural observations unless they can be compared to null expectations (Vazquez and Aizen 2003). Generality and other structural properties of ecological networks can be strongly influenced or driven by stochasticity, sampling effort, and sampling biases. In addition, while species interactions can be structured by ‘true’ evolutionary or ecological processes, such as coevolution between specialized partners or preference for certain interactors, they can also arise due to more ‘neutral’ processes, such as the underlying distribution of species abundances (Dormann et al. 2009; Blüthgen 2010). One way to ensure that interaction network patterns are representative of ‘true’ ecological or evolutionary processes (Dormann et al. 2009) is to compare observed network metrics to what is expected by null models (Blüthgen 2010). 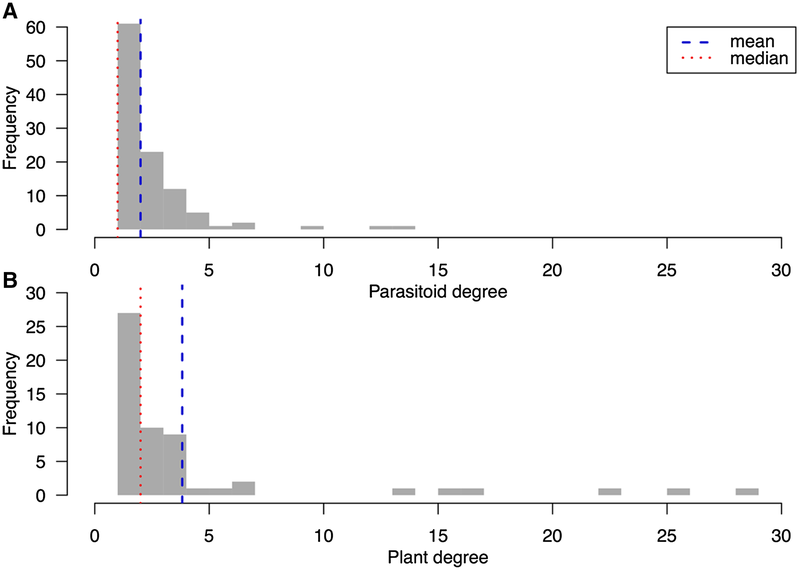 To contextualize the observed metrics of parasitoid-flower interactions observed by Robertson, we compared them to two null models commonly utilized in ecological network studies (Vazquez and Aizen 2003). Since parasitoids could be opportunistic nectar foragers (and not pollen specialists like bees), it may be that interactions between flowers and parasitoids occur at random. To evaluate whether metrics describing parasitoid-flower interactions deviate from what is expected by random chance, we compared them to 1000 randomly shuffled versions of the observed interaction matrix (Null Model 1). These were constructed with the “shuffle.web” function in the package bipartite (Dormann et al. 2009), which maintains the total number of interactions but does not maintain the marginal row and column sums of the observed interaction matrix. Comparison to this null model asks whether the metric for the observed web is different than what is expected if parasitoids and flowers interacted at random. For example, if the observed average number of flowering plant species visited by parasitoids (average parasitoid “degree”) is not different than what is expected by Null Model 1, then parasitoids would not be more or less generalized in terms of nectar foraging than what is expected by random chance. Alternatively, instead of reflecting totally random interactions, an interaction between a given flower and parasitoid may simply be determined by the relative abundance of each species. If this were the case, parasitoids would be more likely to visit abundant rather than rare flowers, and interactions between rare parasitoids and rare flowers would be uncommon. Further, species observed only once would be more likely to be rare and not truly specialized. To determine whether parasitoid-flower interactions are driven by relative abundance of species, we constructed 1000 matrices that assign interactions according to each species’ interaction frequency; the interaction network is shuffled but is constrained to match the marginal row and column sums of the observed interaction matrix (Null Model 2). This null model therefore asks whether the observed metric is different than expected given a parasitoid and flowering plant community that interacts based on relative abundances. For example, if the observed average number of flowering plant species visited by parasitoid species (parasitoid degree) is not different than what is expected by Null Model 2, then parasitoid degree is not different than what is expected if parasitoid species visit flowers in proportion to flowering plant species abundance in the network. Construction of Null Model 2 was achieved with the “nullmodel” command and method = “r2d” in bipartite. It is important to note that this null model assumes that the relative abundances of flowers and parasitoids in the community are reflected by their interaction frequencies, a common assumption in flower visitor network analyses. For the following metrics, we compared the observed value to the null distribution of values from 1000 iterations of Null Webs 1 and 2. If the observed metric fell outside the 95% confidence intervals of null webs, it was considered significantly different from the null expectations. In ecological communities, species range from being highly specialized to highly generalized in their interactions. In terms of parasitoid nectar foraging, it would be useful to know if particular taxa are super-generalists because a wider range of plant species could support super-generalists in conservation biological control. To elucidate the presence or absence of super-generalists, we assessed the shape of plant and parasitoid degree distributions. The shape of a degree distribution is indicative of whether or not there is an upper-limit to degree for each type of interaction partner in an interaction network (Table S1; Bascompte and Jordano 2013). Best fit to an exponential distribution suggests no species have a higher number of interaction partners (degree) than expected by random interactions. Best fit to a power law distribution suggests most species have low degree, but a few species in the community have many more interaction partners than expected by chance. Finally, best fit to a truncated power law distribution suggests most species have low degree while some species are highly generalized, but there is an upper-limit to just how high the degree of a species can be. We used the “degreedistr” function to compare the fit of exponential, power law, and truncated power law distributions to the observed parasitoid degree distribution (there were not enough data to assess best fit for the flowering plant degree distribution). Model fit was assessed using AIC, where dAIC > 2 indicated that alternative distribution(s) were clearly worse (Burnham and Anderson 2001). We determined the average number of interaction partners (degree) separately for flowers and parasitoids with the “grouplevel” command and “mean number of links” index in bipartite and compared them to the average degree expected by Null Models 1 and 2. However, it is important to note that although degree is a simple metric to interpret, it is easily biased by sampling intensity: a parasitoid species that is truly generalized in terms of nectar foraging may appear specialized if it is sampled infrequently, which could be due to inconspicuousness (sampling error) or true rarity in the community (i.e., it may have been observed foraging on only one flowering plant species when, in reality, it can access nectar from many flowering plant species; Vazquez and Aizen 2003; Blüthgen et al. 2008; Fründ et al. 2016). Unfortunately, for Robertson’s parasitoid-flower interaction data, the relative abundance and sampling effort across flower and parasitoid species are unknown. Consequently, the prevalence of specialists may be over-estimated; species that appear specialized may simply have been sampled infrequently. Therefore, we utilized an alternative metric (d′) that estimates specialization but is less sensitive to sampling effort than degree (Blüthgen et al. 2006; Fründ et al. 2016). Species specialization, or d′, describes how much a species deviates from a neutral model which assumes interactions are based on partner availability (Blüthgen et al. 2006). If a species interacts with an uncommon partner species (e.g. the interaction is more frequent than expected given the partners’ relative abundance), then d′ is closer to 1, and it is considered to be more specialized. Species with d′ closer to 0 interact with species in proportion to their relative abundances and is considered to be more generalized. We determined whether average d′ was different than expectations of both null models. This exercise is similar to comparing the observed average degree of flowers and parasitoids to what was expected under Null Model 2 (if parasitoids and flowers interact based on their relative abundance/observation frequencies) but instead focuses on individual species in the network instead of the average across all species. Finally, we highlighted parasitoid and flowering plant families with species that appeared to be specialized based on their low number of interaction partners (degree = 1) but that had a low d′ value (d′ ≤ 0.50) indicating that they might not actually be specialists. We explored the overall structural properties of parasitoid-flower interactions by assessing compartmentalization and nestedness of the network. Compartmentalization was assessed using the “compart” function in bipartite, which counts the number of distinct subwebs/groups of parasitoids and flowers that interact only with each other and not any other members in the community. The observed number of compartments was compared to the average number of compartments expected under both null models. Significantly compartmented interactions show specialization at the scale of the entire network and would suggest that not all flowers are suitable nectar hosts for parasitoids, perhaps due to incompatible morphologies or non-overlapping phenologies (“forbidden links” Olesen et al. 2011). In contrast, a significantly nested network structure would be notable because it would indicate that both specialist and generalist parasitoids could be supported by the same flowering plant species. Nested networks have a core of generalist species that interact, and highly specialized species tend to interact with a subset of that generalist core (Bascompte et al. 2003). Nestedness was estimated using the “nested” function and method = “NODF2” which ranges from 0 to 100, where 100 indicates perfect nestedness. Variation in number of flowering plant species visited for all parasitoids in the network (the parasitoid degree distribution) was best fit by a truncated power law distribution (p < 0.001, dAIC = 8.01; Figure S1; Table S1). This implies that some parasitoid species visit more species of flowering plants (i.e., are more generalized) than would be expected by chance, but their generality is bounded by an upper-limit (Table S1). There were 11 super-generalist parasitoid species (outliers falling outside the 75th percentile of the parasitoids degree distribution). Three of these species had a degree higher than the 95th percentile (Figure S2). On average, each parasitoid species visited flowers of 1.99 plant species (median = 1; Fig. 2a). The parasitoid with the highest degree, Ceratogastra sp. (Ichneumonidae), visited flowers of 13 plant species; in contrast, 61 of the 107 parasitoid species were observed visiting only one flowering plant species. Mean degree of parasitoids was not different than expected if flowers and nectar foraging parasitoids interacted at random (Null Model 1). Mean parasitoid degree was significantly higher (i.e., species were more generalized) than would be expected if parasitoid-flower interactions were structured by the relative abundance of each species (Null Model 2; Fig. 3a). On average, each flowering plant species was visited by 3.8 parasitoid species (median = 1.5; Fig. 2b). Out of all 56 flowering plant species, 27 were visited by only one parasitoid species. The flowering plant species with the highest degree, Sium suave (Apiaceae), was observed to have 28 parasitoid species visiting its flowers. The average number of parasitoid species each flowering plant species was visited by (flower degree) was significantly higher than expected in both null models; flowers have a slightly higher degree than what is expected if flowers and nectar foraging parasitoids interacted at random (Null Model 1) and a much higher degree than expected if parasitoids and flower interactions were structured by relative abundance of each species (Null Model 2; Fig. 4a). 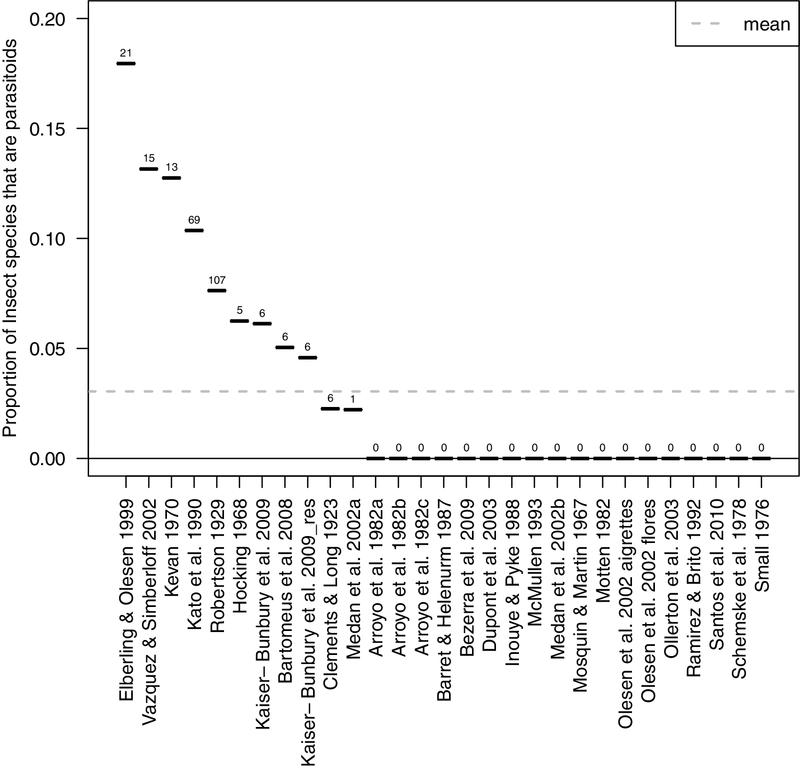 The average species specialization (d′) of parasitoids was 0.33 (median = 0.23). For flowering plant species, average d′ was 0.49 (median = 0.50). For both parasitoid and flowers, average d′ was not significantly different than what is expected if flowering plant and parasitoid species interacted at random (Null Model 1). However, the average d′ values for parasitoids and flowers were significantly lower (i.e., species were more generalized) than expected if parasitoids and flower interactions were structured by the relative abundance of each species (Null Model 2; Figs. 3b, 4b). Together, these results suggest that some parasitoids and flowering plant species in the network appear specialized based on their degree (number of interaction partners) but might actually be more generalized based on their low d′ value. This could indicate that some species have a low degree because they were under-sampled and not because they were true specialists. Indeed, 41 of the 107 parasitoid species with one interaction partner (degree = 1) had low d′ values (d′ ≤ 0.50). This included 14 species belonging to the family Ichneumonidae, 13 Braconidae, 6 Figitidae, 5 Pteromalidae, 2 Scelionidae, and 1 Chalcididae (Fig. 3c). For flowers, 14 of the 56 species had degree = 1 but d′ ≤ 0.50. This included 8 species of Asteraceae, and 1 species each from Anacardiaceae, Apiaceae, Polygonaceae, Rhamnaceae, Rutaceae, and Salicaceae (Fig. 4c). The parasitoid-flower interaction web was significantly more nested than webs constructed from both null models (Fig. 5a). This implies that interactions among parasitoid and flowering plant species are organized such that parasitoid species observed on few flowering plant species (the majority of species observed) tended to visit a subset of flowering plant species that were visited by the more generalized parasitoid species, and that interactions between two specialists are rare. In the observed parasitoid-flower network, there were 10 subgroups (compartments) of parasitoids and flowers that were observed to interact exclusively with each other. This is a significantly higher number of compartments than expected if flower and nectar foraging parasitoids interacted at random (Null Model 1) but no different than expected if parasitoid-flower interactions were dictated by relative abundance of each species (Null Model 2; Fig. 5b). Floral nectar is an important non-host resource for parasitoid wasps (Russell 2015). Despite many efforts to sustain populations in agroecosystems, relatively little is known about parasitoid-flower interactions and how dependent each partner is on the other (Wäckers and van Rijn 2012). There are few comprehensive community-level surveys of parasitoid-flower interactions. We found that parasitoids were present in almost half of the flower visitor network datasets in the Interaction Web Database. However, parasitoid species composed a very small proportion of flower visiting species. Through more detailed analysis of the most complete parasitoid-flower subnetwork (Robertson 1929), we found that many flower and parasitoid species seemed to be highly specialized because they were only documented from one interaction partner but, as evidenced by a specialization metric less biased by sampling effects, might actually be more generalized. Finally, the nested structure of the parasitoid-flower network indicates the potential for a subset of the flowering plant community to support both generalist and specialist nectar-foraging parasitoids in the field. Together, these results indicate that some parasitoid species might be more easily encouraged to support broad-based conservation biological control programs than initially expected. Such generalists would be able to utilize a variety of nectar resources, perhaps extending longevity and allowing them to contribute more to control of pest populations. Moreover, these results suggest that careful selection of a few key flowering plant species could provide resources to the majority of parasitoid species. While flower-visitor network surveys employ intensive observations of focal flowering plant communities and document species-specific parasitoid-flower associations, they should not be viewed as comprehensive records of parasitoid-flower ecological interaction structure. Eleven of the 29 flower visitor networks from the IWD included parasitoids, although most at low proportions compared to other visitor taxa (Fig. 1). This is not surprising since the goal of these datasets was to assess plant-pollinator interactions, not parasitoid-flower interactions. The flower visitor dataset with the most speciose parasitoid-flower subnetwork (Robertson 1929) has been valuable for pollination ecologists (Memmott and Waser 2002; Memmott et al. 2004, 2007; Burkle and Alarcon 2011; Burkle et al. 2013) and for describing natural enemy-flower associations which may have value for biological control (Tooker and Hanks 2000; Tooker et al. 2006). Due to the high number of hymenopteran parasitoid species in this dataset, we were able to conduct one of the first analyses of parasitoid nectar-foraging ecology at the scale of a plant community. At first glance, it seemed that parasitoids are highly specialized in nectar foraging because 61 of the 107 parasitoid species interacted with the flowers of just one plant species (Fig. 2a). However, relative to null interaction models, we found that parasitoids had a higher number of interaction partners (degree) than expected if parasitoid-flower interactions were driven solely by the relative abundance of both taxa (Null Model 2; Fig. 3a). This finding may be driven by the presence of a few parasitoids that were more highly generalized than most species, pulling up the mean degree (Fig. 2a; Figure S2). Indeed, similar to plant-pollinator networks (Bascompte and Jordano 2013), the parasitoid degree distribution was best fit by a truncated power law, which indicates most species have low degree, and there are upper bounds to the number of flowering plant species a parasitoid might visit (Table S1, Figure S1). Considering degree alone, one might conclude that many parasitoids are highly specialized in nectar foraging; if that were the case, floral support for these species in conservation biological control would require one or a few specific plant species that might not do well in a given setting. However, many species with low degree also had a low d′, indicating that they might actually be more generalized and therefore able to be supported by a variety of flowering plant species in the field (Fig. 3c). The potential over-estimation of parasitoid specialization may have been due to biased sampling towards larger species, which is common in observations of parasitoids on flowers (Wäckers and van Rijn 2012). Large parasitoid species such as most ichneumonids lack elongate mouthparts such as concealed nectar extraction apparatus (CNEA; Jervis 1998) and are also too large to fit within many flower nectaries; this typically restricts these species to flowers with short, accessible nectaries (Patt et al. 1997). Therefore, over-inclusion of large species may over-estimate specialization. Under-sampling small parasitoids could be due to their lower detectability, their ability to escape through mesh of collection nets, or from foraging in concealed nectaries (Kevan 1973), which they visit for relatively longer time periods than larger parasitoids (Jervis et al. 1993). Since small parasitoids may be able to access nectar from more flowering plant species, under-sampling small parasitoids may also contribute to over-estimating specialization. However, floral structures, such as trichomes, can exclude nectar access by small-bodied parasitoids (Patt et al. 1997). Future studies could include measurements of parasitoid body size to assess this hypothesis, similar to previous work (Patt et al. 1997). Also, future work should include documentation of sampling effort across flowering plant species (Fründ et al. 2016) and the relative abundance of plant species in the community (Blüthgen et al. 2008), as both can influence estimates of generalization/specialization (Blüthgen et al. 2008; Fründ et al. 2016). Generalized nectar foraging by parasitoids may correspond with a variety of parasitoid phenotypic and life history traits. First, most parasitoid species are very small-bodied, and should be able to physically access nectar of most flowers (Kevan 1973; Jervis et al. 1993), unless they are obstructed by floral traits such as small corolla apertures (Patt et al. 1997) or trichomes (Brewer et al. 1983). Second, some larger-bodied species may access concealed nectar by robbing (Idris and Grafius 1995, 1997) or via elongated mouthparts (CNEA) which have evolved independently multiple times within the parasitic Hymenoptera (Jervis 1998). However, analysis of the parasitoid degree distribution suggests that super-generalist parasitoids are rare (Table S1, Figure S1). Indeed, we found that only 11 out of the 107 parasitoid species had a degree falling outside the 75th percentile of the degree distribution, and only three of these had a degree higher than the 95th percentile (Figure S2). Upper limits to generality may occur because nectar needs to be morphologically accessible, and even across morphologically accessible flowers, preference for nectar resources can vary across plant species (Idris and Grafius 1995). One reason for this is that benefits from nectar consumption can depend on plant species; nectar from certain flowers may be difficult to ingest if it is prone to evaporation, as is the case in species with exposed nectaries such as those in the family Apiaceae (Jervis 1998), or species that contain more or less favorable sugar concentrations (Wäckers 1999; Tompkins et al. 2010). Other nectar characteristics that may influence parasitoid preference include presence of secondary metabolites, volatiles, and nectar-inhabiting microbes (Lenaerts et al. 2017; Sobhy et al. 2018), though these relationships have yet to be tested. Parasitoids may also have foraging preferences based on other (non-nectar) floral traits; for example, parasitoids may prefer visiting flowers with white corollas (Kevan 1973). To understand parasitoid-flower ecology, especially with goals of contributing to conservation biological control, it is also important to acknowledge how generalized flowers are with respect to parasitoid visitation, because it would be efficient to sow species that support a high diversity of nectar foraging parasitoid species; parasitoid diversity can translate to greater pest control (Tylianakis and Romo 2010) if the constituent parasitoids attack target pest species. Degree and d′ revealed that flowers vary in how generalized they are in terms of their interactions with nectar-foraging parasitoids (Fig. 4a, b). Six of the ten most generalized flower species belong to the family Apiaceae, which is known for having exposed and easily accessible nectaries (Fig. 4c; Tooker and Hanks 2000). Umbelliferous flowers, or more generally, flowers with exposed nectaries, have repeatedly been noted as important for parasitoids (Bugg and Wilson 1989; Maingay et al. 1991; Jervis et al. 1993; Al-Doghairi and Cranshaw 1999) and have been the primary focus of nectar foraging studies (Russell 2015). We echo the importance of umbellifers in providing sugar resources to parasitoids but also suggest other flowering plant taxa may be under-estimated in terms of their nectar resource quality. Flowering plant families with species that initially seemed specialized (degree = 1) but might actually host a higher number of nectar foraging parasitoid species (d′ ≤ 0.5) include Apiaceae, Anacardiaceae, Asteraceae, Polygonaceae, Rhamnaceae, Rutaceae, and Salicaceae (Fig. 4c). While flowers from the families Apiaceae, Asteraceae, and Polygonaceae have been utilized in conservation biological control, the other families are relatively under-explored in terms of their value in supporting nectar-foraging parasitoids in agroecosystems (Russell 2015). Considering the broader structural properties of parasitoid-flower interactions is important in determining whether flowers and parasitoids tend to interact in smaller, isolated communities, or in larger, interconnected communities. Although there were 10 distinct parasitoid-flower subwebs in the network, this level of compartmentalization was not significantly different from null expectations (Fig. 5b). On the other hand, we found that parasitoid-flower interactions are significantly nested in structure (Fig. 5a), indicating that their interactions are broadly interconnected and arranged in such a way that specialized parasitoids tend to interact with a subset of flowers that generalized parasitoids visit. Our analysis documents nestedness, but with the data available we cannot determine what drives nested structure. Nested structure could result from parasitoid preference and/or the relative abundance of interacting species (Dupont et al. 2003). In terms of supporting parasitoids in agroecosystems, our results indicate that (1) many parasitoid species may be supported by few flowering plant species; (2) specialist parasitoids are likely to forage on a subset of the flowers on which generalists forage; and (3) flowers with exposed nectaries (e.g., Apiaceae) may host the highest diversity of parasitoid species, but other flowering plant taxa may also support multiple parasitoid species. Ultimately, choosing flowers for use in conservation biological control will depend on specific management goals and resources available to inform the decision. If the management goal is to support the highest diversity of parasitoids, and/or research effort is limiting (Jervis et al. 1993), then flowers with exposed nectaries (i.e., umbellifers) could be an appropriate choice, at least for large-bodied parasitoids and small-bodied parasitoids that are able to consume viscous nectar. Alternatively, if the target is to support specific parasitoid species, then knowledge of nectar foraging preferences of these species is necessary (e.g. by rigorous surveys of nectar foraging in the field and in lab trials). Finally, if managers anticipate ecosystem disservices from floral diversification (e.g., benefiting pests as well as parasitoids), then it will be important to understand both pest and parasitoid natural histories. For example, flower species in the family Apiaceae are known to support many parasitoid species but can also support pest species (Winkler et al. 2009). In these cases, it might be preferable to select flower species with nectaries accessible to parasitoids but not pests, and alternatives to umbellifers may be a good option (Fig. 4c). In summary, we document a simplified example of how a network approach can be used to better understand parasitoid nectar foraging ecology. Our analysis was limited by unknown sampling effort by Robertson. Nevertheless, some of the patterns we found could have been driven by the relative abundance of species or unequal sampling effort across species (e.g., fewer observations of small parasitoid species). Since the majority of flower-visitor networks from the Interaction Web Database did not include any parasitoid species, or observed very few parasitoid-flower interactions, future explorations of parasitoid-flower interactions should rely on datasets that specifically target parasitoid nectar foraging. Future parasitoid-flower community data should include standardized and thorough observation times, quantitative measures of visitation, estimates of floral abundance, and timing of interactions. Observations across seasons or years, and measurements of parasitoid and flower traits would further enable our understanding of what factors drive parasitoid-flower interactions, as would studies focusing on nutritional ecology of adult parasitoids. These datasets will be useful in understanding parasitoid-flower ecology to ultimately inform successful conservation biological control practices. We would like to thank Jay Rosenheim, Marshall McMunn, Moria Robinson, Eric LoPresti, and Michael Culshaw-Mauer for helpful feedback on the manuscript, as well as Nicholas Fabina, Jochen Fründ, and Neal Williams for feedback on networks metrics. Reviews from Joe Patt and two anonymous reviewers greatly improved the manuscript. This material is based upon work supported by the National Science Foundation Graduate Research Fellowship under Grant No. DGE-1148897 and Doctoral Dissertation Improvement Grant No. DEB-1501620. LR was supported by a Marie Curie Individual Fellowship (FOMN 705287) and NSF #DMS-1313115. Any opinions, findings, and conclusions or recommendations expressed in this material are those of the author(s) and do not necessarily reflect the views of the National Science Foundation. Mention of trade names or commercial products in this publication is solely for the purpose of providing specific information and does not imply recommendation or endorsement by the USDA. USDA is an equal opportunity provider and employer.